Make it easy for restaurant guests to reserve a table online. 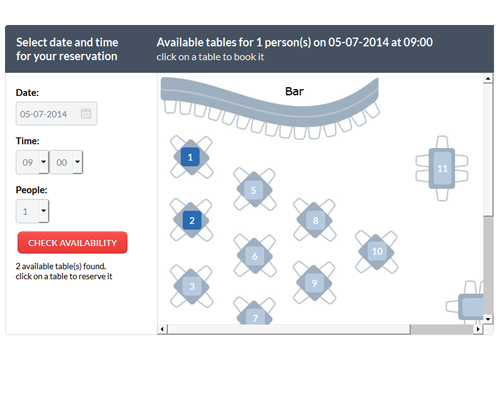 With our Restaurant Booking System everyone can make a reservation in a restaurant. Restaurant Booking System is a simple and easy-to-use online restaurant reservation system featuring all the functionality needed for online table booking & management: guest enquiry, quick online booking, reservations management, email and SMS reminders, online payment integration and more. A restaurant reservation software with an easy web based and password protected admin panel that can be accessible from any computer with internet connection as soon as you have the right logins. Using the admin panel even a user with no programming skills can manage reservations, table availability, set email auto responder and manage payment getaways. Restaurant Booking System is fully supported, affordable and scalable solution for those who need online table reservation software for their own website or will use the restaurant reservation system for work-projects. With a Developer License you can install Restaurant Booking System on an unlimited number of websites, modify the PHP SOURCE CODE or re-brand the software! A Developer Licence is an ideal solution for web programmers. You will cut down the expenses while having also the opportunity to extend and build on a professional and stable ground. Regular updates, one time fee & FREE installation support. Fully featured FREE Demo is available for our Restaurant Booking System! This site does not contain serial number, crack, keygen Restaurant Booking System by StivaSoft serial number : serial number is the simplest type of crack. A serial number(cdkey,product key,etc) is register the program as you may already know. a crack or keygen may contain harmful software. If you cannot find the exact version you want, just give it a try. for more information read .nfo/.txt/.diz file include in zipped file.